My Gout Foods Tables summarize key facts about key foods based on data in the USDA nutrition database. The tables will help you make better gout diet choices by considering the main nutritional data that might affect your gout. Summarize the nutritional content of your current food and drink intake, or a diet plan you are considering. Improve current intake, or your plan, by choosing food items that help you meet your goals. To make the most out of my gout foods tables, you should understand how the different nutritional components of food might affect your gout. If you follow the links in my explanations below, you will learn why each element is important in different ways. Each table includes a “standard food item” that you can compare your choices against. I include it for reference purposes, not to indicate what you should avoid or eat more of. More importantly, it is based on average nutrition goals. Your personal goals will be different. I am creating a service to provide personal gout foods analysis, but this will not be available this year. You can still use these tables very effectively, but only if you understand how each column in the table relates to you and your goals. Please note that these tables do not include purines. There is insufficient reliable purine data available to check every food. Instead, I will add extra information to the high purines foods tables so that you can check purine intake once you have created your healthy eating plan. Most food tables based on USDA food database, including most of my tables in the past, show information based on 100g portions. Standard weights make it slightly easier to summarize food intake, but they make it much more difficult to compare foods. As most people use the tables to find better food options, I have chosen to present the data by standard energy rather than standard weight. The limiting factor in your diet is energy. My tables show nutritional information for a food portion that will provide 100 calories (Kcals). The first column is the size of that food portion in grams. When you are doing your own food analysis, take the weight of your food item then scale the nutrient values in the other columns accordingly. When you are analyzing your totals, it is easy to replace 100 calories of one food item with a better alternative. My interactive service will make the summary, analysis and improvement stages very easy. I will include conversions to different weight units and all the calculations you need. In the meantime, if you need help, just ask in the gout forums. You can see why this might be important for gout sufferers in the Vitamin C and Gout guidelines. High vitamin C intake usually requires dietary supplements. However, if you want to avoid supplements, go for the highest vitamin C content of food. Potential Renal Acid Load (PRAL) is a calculation used to help manage an alkalizing diet. You can read more about the principles in the alkalizing gout diet menu guidelines. Be careful when making changes based on PRAL score. You must have a mixture of acid (positive PRAL) and alkaline (negative PRAL) in your diet, with an overall negative score. There is no goal for PRAL. Use the scores to make better choices, but the only way to be sure is to test urine pH. Excess iron is often overlooked, yet we know that iron can cause gout. There are no rules for setting your maximum or minimum iron content. However, if your iron intake is over the recommended 18mg per day, you should seek your doctor’s advice about a good target for iron. He can test your current iron levels, and advice the best way to manage iron. The tables will help you choose foods with better iron content. My index is based on the concept of an imaginary standard food. This is a benchmark, not a target. Indeed, we have seen that for PRAL, there can never be a single standard, as we must have variety. The numbers in the standard are based on a 2000 calorie intake, and each food item is listed as a 100 calories portion. Therefore, I have divided recommended daily values by 20 so that 2000 calories will produce the recommended daily value in total. If you have a higher calorie goal, the tables still work well. Just focus on getting the right totals then making better choices. Remember, it is your daily total that matters. The index number just acts as a guide to help you understand your own diet. In a good diet, some foods will be lower and some higher. This variety is important. Take your current daily food intake, or intended eating plan, and summarize the totals from each table. Spreadsheets are great for this, but pen and paper work just as well. Analyze the totals to see where you need to make changes, then look at individual foods. It is easiest to change the bigger contributors. If your summary shows you have too much iron, go to your foods that have the highest iron content. 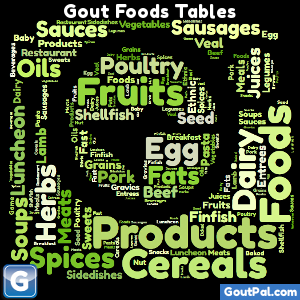 Then go to the relevant gout foods table sorted by iron, and change to something lower in the list. Alternatively, reduce the portion size, and replace it with a low iron food. If you need help using the gout food tables, please ask in the gout forums. If you want to be alerted by email when I add new tools to make personal tables available, please subscribe to my free gout information update service. Leave Gout Foods Tables Introduction to browse the Gout Foods Guidelines.